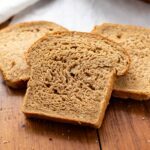 This hearty grain bread is the perfect homemade bread to bake up! It has a smattering of flours that truly make it a hearty bread that’s great for toast! In the bowl of an electric mixer, whisk together the whole wheat flour and yeast. Add the water, oats, dry milk, wheat germ, ground flaxseed, walnuts, oil, molasses, and salt. Mix on medium speed until a wet, shaggy dough forms. Turn the mixer off and add the rye flour and 2 cups of the all-purpose flour. Turn mixer back to medium for 5 minutes. At this point, check the dough. If it is still sticking to the sides of the bowl, add more flour, 1 tablespoon at a time until the dough becomes a cohesive ball and cleans the side of the bowl. Grease a large bowl and place the dough in the bowl. Cover with plastic wrap and set in a warm place until doubled in size, about 1 hour. Once risen, fold the dough to release air, and form into a loaf. Grease an 8 ½ x 4 ½ inch loaf pan and place dough inside. Cover with plastic wrap and let the dough rise until doubled and domed above the loaf pan, about 45 minutes. While rising, preheat oven to 375 degrees Fahrenheit. Once risen, place in the preheated oven and bake until dark brown, about 55-70 minutes. The bread should register 200 degrees Fahrenheit on an instant-read thermometer when inserted into the center of the bread. Remove from the oven and cool 15 minutes in the pan. Remove from the pan and cool four hours before slicing.